Great for anyone exploring a kiwi family history or building a family tree, this data set is a digitisation of an important early directory of New Zealand. The directory covers: Wellington, Hokitika, Omaru, Picton, Auckland, Greymouth, Timaru, Napier, Dunedin, Invercargill, Akaroa, Tauranga, Christchurch, Bluff, Lyttelton, Onehunga, Nelson, Port Chalmers, Blenheim, Otahuhu, Wanganui, &c.
"A complete epitome of the official, general, and provincial government appointments, (from official sources,) and full statistical, general, and descriptive information regarding the whole colony, and its resources, etc." 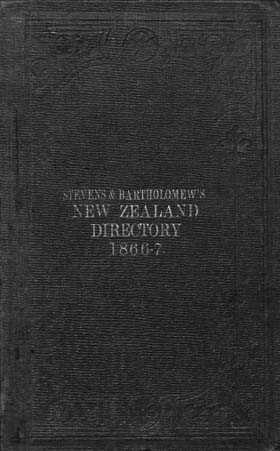 New Zealand Yearly Advertiser - approximately 100 pages of advertisements - itself a useful genealogy resource.